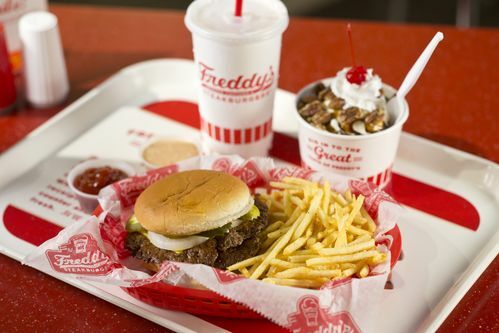 Freddy's Frozen Custard and Steakburgers is coming to Warner Robins. The 1940s & 50s-themed fast-food joint will be located at 678 Lake Joy Road, near the junction of Lake Joy Road and Highway 96. One-hundred customers will be able to sit inside the restaurant or order at the drive-thru window. A press release states it should be open by summer. The menu includes ground beef steakburgers, hot dogs, fries and an assortment of desert treats with the customer's choice of chocolate or vanilla frozen custard. "We're excited to bring our family-friend restaurant concept to the Warner Robins community," Ray Yarbrough, the franchise owner, said in a statement. "It's a traditional, mid-western style of cooking." The release states the restaurant was co-founded in 2002 in Wichita, Kansas.